The vehicular bridge will be located on West Avenue over the Collins Canal from 17th Street to 18th. It will have one southbound and one northbound travel lane as well as a dedicated southbound left turn lane and new sidewalks on both sides of the bridge. 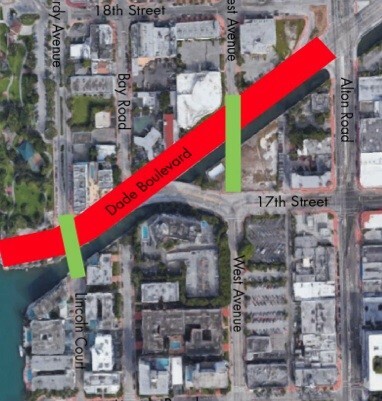 The pedestrian bridge will connect Lincoln Court on the south side of Dade Boulevard with Purdy Avenue to the north. The vehicular bridge will be pre-fabricated allowing for quick installation according to Mowry. At this point, residents have the opportunity to influence the aesthetics and residents were presented with several options. An overwhelming number supported making the bridge look as much like the nearby Venetian Causeway as possible. After considerable discussion with regard to the pedestrian bridge, the community sought a simple, open design of railings. There continues to be frustration over the traffic and traffic patterns in the area and residents were not happy with the addition of a light at Bay Road and Dade Boulevard. City Transportation Manager Josiel Ferrer says the City is working on a simulation model now that they hope to have ready to discuss with the community “within the next month or so.” He added, “We are looking at outside the box scenarios” for solving the traffic issue. Scott Diffenderfer, President of the Belle Isle Residents Association says “We need to look at this holistically rather than piece by piece” and echoed the need for outside the box thinking. The road is expected to be completed by end of May with both the West Avenue vehicular bridge and the pedestrian bridge anticipated opening in August of 2017. The project cost is $10 million. For more information, contact Melissa Rodriguez via email or at 305-570-8076.